Home › Toys › 3-In-One Wooden Puzzle Games Set - 3D Puzzles For Teens And Adults - Includes..
3-In-One Wooden Puzzle Games Set - 3D Puzzles For Teens And Adults - Includes..
What's better than having a puzzle game at the ready to help you pass thetime? How about having three challenging games? 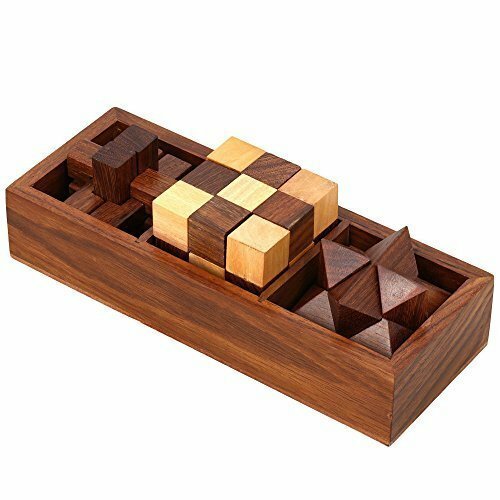 The 3-in-One Wooden PuzzleGames Set triples the fun by giving you three puzzle games that you can playat home or at the office. Perfect for passing the time on a rainy day, takinga break from the stresses of your day and keeping your mind sharp, this set issure to delight any adult or teen. The puzzles included in the 3-in-One Wooden Puzzle Games Set are threedimensional building games. Each one consists of a wooden pieces, which aredesigned to be fit together to create a finished three-dimensional shape.Solving the puzzle takes patience and skill, and you can enjoy putting thepieces together again and again. The set includes a diagonal burr, a snakecube and interlocking blocks. With the 3-in-One Wooden Puzzle Games Set, you'll never have to worry aboutpieces becoming lost or damaged. The set includes a wooden tray with threecompartments, so that you can keep the loose pieces or the assembled puzzlesinside until you're ready to play again. The tray measures 7 inches by 2.5inches in size and is made from the same high quality sheesham hardwood as thepieces. Constructed entirely by hand, the 3-in-One Wooden Puzzle Games Set shows offIndian woodworking at its finest. This set is so attractive that it can easilybe used as a decoration in a den, family room, office or waiting room. It'salso a favorite table game for cafes and coffee shops. Because the pieces andthe storage box are handcrafted, you're guaranteed to be impressed with thequality of the game set. See if you have what it takes to assemble three challenging 3D puzzles or putsomeone special to the test! Order the 3-in-One Wooden Puzzle Games Set foryourself or to give as a gift for any occasion.